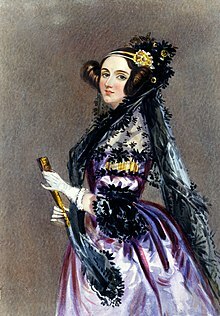 ↑ ୩.୦ ୩.୧ ୩.୨ "Ada Lovelace honoured by Google doodle". The Guardian. 10 December 2012. Retrieved 10 December 2012. ↑ Toole 1998, pp. 234–235. ↑ Toole 1998, pp. 156–157. ↑ Fuegi & Francis 2003, pp. 19, 25. ↑ Stein 1985, p. 14. ↑ ୧୦.୦ ୧୦.୧ Turney 1972, p. 35. ↑ ୧୧.୦ ୧୧.୧ Stein 1985, p. 17. ↑ Stein 1985, p. 16. ↑ Woolley 1999, p. 80. ↑ Woolley 1999, pp. 74–77. ↑ Turney 1972, p. 138. ↑ Woolley 1999, p. 10. ↑ Woolley 1999, pp. 85–87. ↑ Woolley 1999, p. 86. ↑ Woolley 1999, p. 119. ↑ Woolley 1999, pp. 120–21. ↑ Turney 1972, p. 155. ↑ Woolley 1999, pp. 138–40. ↑ Turney 1972, pp. 138–39. ↑ ୨୫.୦ ୨୫.୧ Turney 1972, p. 139. 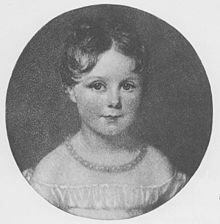 ↑ "Ada Augusta Byron", The Peerage . ↑ Woolley 1999, pp. 285–86. ↑ Woolley 1999, pp. 289–96. ↑ Turney 1972, p. 159. ↑ Turney 1972, p. 160. ↑ Moore 1961, p. 431. ↑ Woolley 1999, p. 302. ↑ Woolley 1999, pp. 340–42. ↑ Woolley 1999, pp. 336–37. ↑ Woolley 1999, p. 361. ↑ Baum 1986, pp. 99–100. ↑ Woolley 1999, p. 370. ↑ Woolley 1999, p. 369. ↑ Stein 1985, pp. 28–30. ↑ Stein 1985, p. 82. ↑ Toole 1998, pp. 91–100. ↑ Simonite, Tom (24 March 2009). 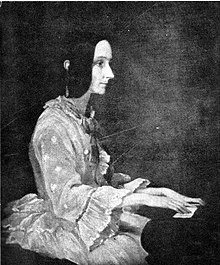 "Short Sharp Science: Celebrating Ada Lovelace: the 'world's first programmer'". New Scientist. Retrieved 14 April 2012. ↑ Parker, Matt (2014). Things to Make and Do in the Fourth Dimension. Farrar, Straus & Giroux. p. 261. ISBN 0374275653. ↑ " Tom Stoppard’s 'Arcadia,' at Twenty". The New Yorker. ↑ Doctorow, Cory (5 October 2009). "Comic about Ada Lovelace and Charles Babbage". BoingBoing. Retrieved 10 October 2014. ↑ "Lovelace Lecture & Medal". BCS. Retrieved 2 March 2008. ↑ "Undergraduate Lovelace Colloquium, BCSWomen". Leeds. Retrieved 6 March 2008. ↑ "BCSWomen Lovelace Colloquium". UK. ↑ "FAQ". About. Finding Ada. Retrieved 10 December 2012. ↑ "Google celebrates Ada Lovelace's 197th birthday with a doodle". The Times of India. Retrieved 10 December 2012. ↑ "Conference Facilities". Ashfield District Council. Retrieved 21 October 2012. ↑ Kremer, William (1 August 2013). "Crossrail: Where is it in the list of 'big digs'?". BBC News. Baum, Joan (1986), The Calculating Passion of Ada Byron, Archon, ISBN 0-208-02119-1 . 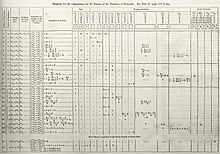 Fuegi, J; Francis, J (October–December 2003), "Lovelace & Babbage and the creation of the 1843 'notes'", Annals of the History of Computing, IEEE, 25 (4), doi:10.1109/MAHC.2003.1253887 . Kim, Eugene; Toole, Betty Alexandra (May 1999). "Ada and the First Computer". Scientific American. .
Lewis, JS (1995). Princess of Parallelograms and Her Daughter. Women's Studies International Forum. 18. pp. 387–94. doi:10.1016/0277-5395(95)80030-S. .
Moore, Doris Langley (1977), Ada, Countess of Lovelace, John Murray . Moore, Doris Langley (1961), The Late Lord Byron, Philadelphia: Lippincott, ISBN 0-06-013013-X, OCLC 358063 . Stein, Dorothy (1985), Ada: A Life and a Legacy, MIT Press Series in the History of Computing, Cambridge, Massachusetts: The MIT Press, ISBN 0-262-19242-X . Toole, Betty Alexandra (1992), Ada, the Enchantress of Numbers: A Selection from the Letters of Ada Lovelace, and her Description of the First Computer, Strawberry Press, ISBN 0912647094 . Toole, Betty Alexandra (1998), Ada, the Enchantress of Numbers: Prophet of the Computer Age, Strawberry Press, ISBN 0912647183 . Woolley, Benjamin (February 1999), The Bride of Science: Romance, Reason, and Byron's Daughter, AU: Pan Macmillan, ISBN 0-333-72436-4, retrieved 7 April 2013 . O'Connor, John J.; Robertson, Edmund F., "ଏଡା ଲଭ୍‌ଲେସ୍‌", MacTutor History of Mathematics archive, University of St Andrews .